SLC’s business classes are specially designed to give staff the skills they need to operate in their industry and in society. Years of experience have translated into a proficiency in getting people up to speed quickly. Courses are flexible and can be tailored to suit your timetable. We minimise disruption by conducting classes in your office or workplace, whether it be for 65 people as REPSOL has contracted previously or just one. Plus, with the option of remote classes via Skype, individuals don’t have to miss classes if their work commitments don’t allow them to make every class. You are welcome to book your team for Spanish at your lunch break. One hour Spanish at your office. You do not need to travel anywhere, you will have your Spanish teacher right there with all study material provided. Studying Spanish at your office is fun and is an excellent way to change your state of mind from work to Spanish. Your team will increase communication among themselves with some Spanish words here and there, everybody will have so much fun. Everybody will be motivated to speak Spanish at work, you will even start to write emails with some words in Spanish to each other, you will have fun at your Spanish lesson and of course you can have your lunch at the same time. What your teacher needs is a room with a computer and a proyector. She will bring the rest. Welcome to book! Patricia has taught with great success 65 executives of Talisman now call Spanish REPSOL, in Eagle Street 10 Brisbane. Companies enjoy Patricia’s structure and teaching contents. 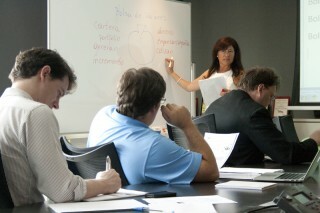 Spanish has help the executives to get to know each other in a very different ways. The day starts with “Buenos días” and finishes with an “Hasta mañana” – Spanish at lunch time at your premises, right in the heart of Brisbane. This course is strongly recommended to all HR that want to increase a positive dynamic within the company. Call SLC on 0400638340 or 3217 2220, patricia@spanishlanguage.com.au or fill out an enquiry form to make sure your staff have the confidence and skills they need for international projects. Do you need Cultural Awareness of South America or Spain? Patricia has organised for THIESS (Integrated engineering and services provider) in Brisbane a very informative Cultural awareness course together with a Doctor of the University of Queensland, who is specialized in mining and ethnology in Antofagasta Region in Chile. Cultural awareness facilitate communication and decition making in the new company base, in this case in Chile- Antofagasta. In business and mining is not just about to know the language is also important to understand how people behave in the Spanish Speaking world. Latinos are smily friendly people with great sense of humor.